Our custom holiday trips to Europe take you to the Christmas markets in Salzburg and Innsbruck, some of which date from the 15th century, where you can feast on roasted chestnuts and gingerbread and shop for wood-carved, hand-made crafts. Or in Vienna, enjoy everyone's favorite Christmas ballet, The Nutcracker, at the opera house. The lights and decorations along the Champs Elysees in Paris are sure to get you into the holiday spirit as will holiday concerts at historic churches in London. There are many destinations to choose from. With a custom holiday trip to Europe, you'll travel independently, leaving on the dates you choose, and enjoy the services of a personal travel advisor every step of the way. Have us plan and arrange a custom trip for you. - Your own custom Iitinerary with a mix of planned activities, tours and time to explore on your own. We can also include flights departing from the U.S.
You'll receive hotel suggestions based on your preferences, style, dreams, and budget and among only those distinctive properties we know are first rate. 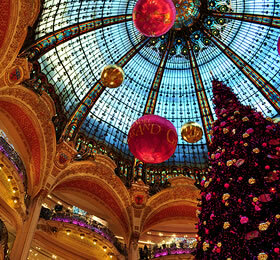 You'll receive suggestions for one-in-a-lifetime experiences such as a holiday concert in one of the beautiful churches in Paris, a ballet performance at the Palais Garnier, shopping excursions, or traditional Christmas dinner at a special restaurant. Your trip will be created for the date you wish to depart and you choose your hotels and activities. - Travel Arrangements - Once your itinerary is finalized, you have the option to have us make your travel arrangements for you and manage the details of your trip. You'll enjoy the services of a personal travel advisor to take care of the details, so all you have to do is dream about and then enjoy your trip. 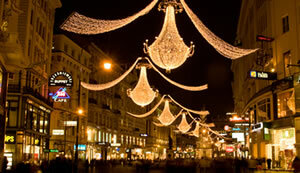 Receive detailed information about our custom holiday trips to Europe. In crafting your tailor-made, Christmas vacation package, we personally match you with hotels, activities, and best ways of getting around, based on your tastes, special interests, and time constraints. To begin, contact us to provide the information we need to make your dream a reality. We'll confirm the details with you to ensure we understand exactly what you're looking for. A retainer for the service may be charged depending on your specific planning needs. We'll mine our resources and contacts in Europe, conduct meticulous research, and draw on our personal experiences traveling in Europe to develop your day-to-day itinerary. You’ll also receive hotel options, and activities that you might enjoy. We'll even suggest options you may not have considered. Within a couple of days you'll get to review the first draft of your trip plan. This is your opportunity to make additional requests and ask questions. We'll collaborate with you to enhance and refine your itinerary. Should you decide to book your trip with us, we'll handle the arrangements and provide payment plans when available, options for travel insurance, reconfirmation of all travel services, pre-trip reminders, and proactive support while you are traveling. You'll gain access to our network of on-the-ground contacts, partners and local experts that offer special amenities only for our travelers. Before you depart, we ship a package to you that includes your final trip plan, confirmations and extras. Completing this form allows us to begin learning about your preferences and how you envision your trip. We respect and protect your privacy. We will not distribute your details without your permission. Like I told you the trip was "inspired". The seats at all the theatre events were outstanding. Kaiserball, oh my. It was worth every penny we spent. We danced a storm. You did an outstanding job in guiding us through these plans. We are so appreciative!!! We were so amazed as to how this trip went without hitch and no disappointments. We have travelled a lot and certainly this one rates among the top. "Inspired Diversions is a travel company designed to help you plan a dream trip."